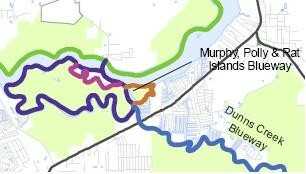 These trails are all surrounding Murphy Island located 7 miles south of the Palatka bridge. The Buffalo Bluff railroad trestle is just south of Murphy Island. The island is part of the 1,842 acre Murphy Creek Conservation Area managed by SJRWMD. It hosts multi-use trails, primitive camping, boat dock and facilities. Murphy Creek maintains a width of about 100 yards its entire length. Rat Island Creek and Polly Island Creek are narrower. 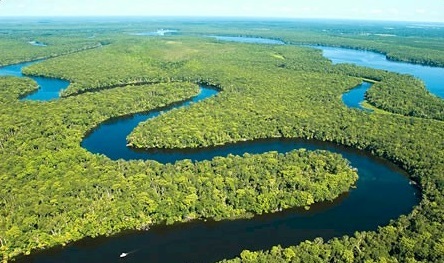 All three creeks join the St. Johns River and Dunns Creek Paddling Trails. The shores are primitive hardwood wetlands with lilly pads and Vallisnaria grass abounding. Murphy Island contains one of a few upland areas along the river and contains sandhill, flatwoods and hardwood hammocks. The bluffs on the island provide an opportunity for a spectacular view of the river and its beautiful sunsets. The Browns Landing community is just across the St. Johns River. There are man-made canals cut into nearby Dunns Creek, home to mobile homes and docks. The Buffalo Bluff community is just south of Murphy Island. Browns Landing is a public boat ramp and floating dock located directly across the river less that ¼ mile from the trails. Crossing the river’s channel is necessary and caution should be used. There is an unimproved landing ¼ mile up Dunns Creek at the Highway 17 Dunns Creek bridge with plenty of parking. This group of paddling trails offers some of the County’s most beautiful waterways. With access to Murphy Island and the surrounding trails a day can easily be spent in this area. The Murphy Island boat dock is 1 mile from Browns Landing. Since primitive camping is available, overnighters are recommended. Fishing and bird watching is outstanding. This is old Florida. There will be motorized traffic, so paddling near the beautiful shoreline is prudent. If launching from Brown’s Landing, you will cross the river’s channel and care should be taken.